The pantry door suffered the same ailment as everything else in the kitchen: it was shiny and orange-hued. But it’s wood, so there was no reason I couldn’t strip off the varnish and paint the pantry door white to match my painted cabinets! 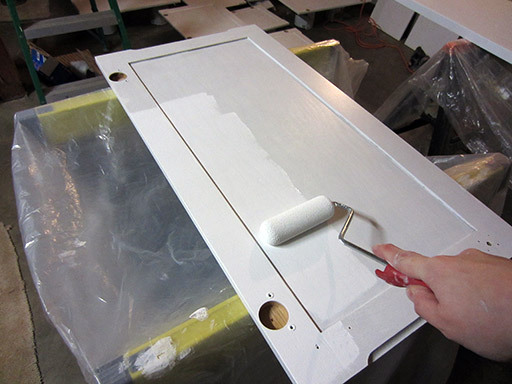 Painting a pantry door is easy – read on! After prepping all those cabinet doors for painting, the pantry door was basically just another, larger, cabinet to strip and sand. 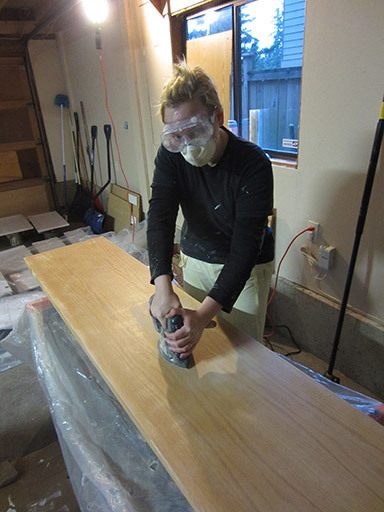 Here I am sanding my pantry door with my corner palm sander. Yellow pants for the win. 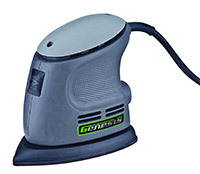 Shop for a palm sander like this Genesis corner palm sander on Amazon. Once the pantry door was sanded smooth and completely free of varnish, I used the same Zinsser Smart Prime from the cabinets on the pantry door’s faces and edge. Since I work full time, I squeezed this painting in wherever I could – usually a session before work and another after work. Primer’s job isn’t really coverage, it’s just to give something for the top coat to stick to, so I called it good enough after 3 thin coats on every surface of the door. I definitely recommend using a primer (especially this one, since it’s held up so well). Two years later, my cabinet and door paint has not chipped or scratched. This primer holds on tight! I rolled the primer on with a small foam roller, which I highly recommend over a fluffy roller. The foam roller makes a much smoother, flatter finish than a fluffy roller. Kitchen cabinets and the pantry door in various stages of drying. 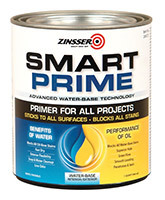 Zinsser Smart Prime works great for painted cabinets and pantry doors. Isn’t it funny how much work goes in before you can actually start painting? Painting was quick and easy. I used the same Benjamin Moore Advance Alkyd paint I used on the cabinets, applying a three thin coats to each side of the pantry door with the mini foam roller. 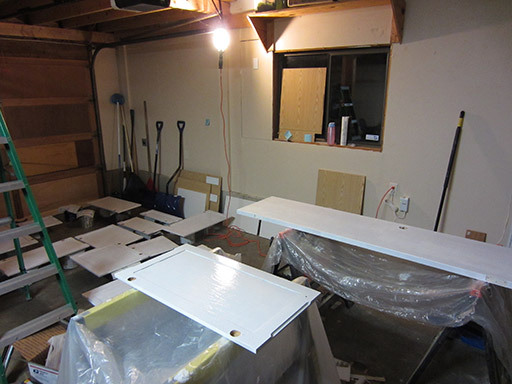 This photo is from a cabinet, but I used the exact same foam roller and painting technique to paint the pantry door. The secret to an even paint job is thin coats evenly applied. So that’s it: sand it, prime it, paint it. Don’t use a latex paint and don’t skip the sanding or priming steps if you want this paint job to be durable enough to survive life in the kitchen! With the cabinet doors and pantry door drying, the next big change was the professional installation of our new range hood. Note to readers: Some links on LevelUpHouse are Amazon affiliate links, provided here to help you find our recommended products quickly. Your purchase through Amazon.com helps support this site at no cost to you – but as always, we encourage you to shop around for the best deal!